Preschoolers are soaking in everything they can about life and learning. It’s a great time to engage in simple and fun learning activities with them. 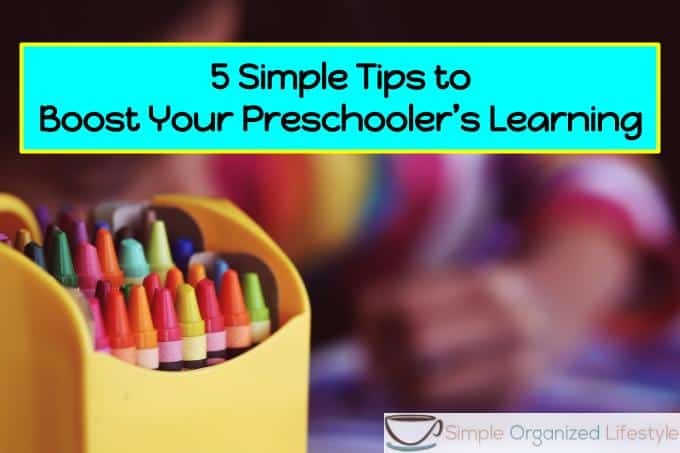 These are 5 simple tips to boost your preschooler’s learning and set them up for success as in their early school years. 1. Make up silly rhyming sentences. Seriously, rhymes and rhyming games are a fantastic way to give your preschooler a boost in their learning. It’s the reason nursery rhymes and some of the most popular children’s stories, such as Green Eggs and Ham, are easily remembered and recited. 2. Point to words when reading aloud. When reading aloud to kids, do things that we’ve long quit doing as adult readers, such as pointing to the words. Don’t skip the title page and author’s name when you start a new book. Just knowing how print works will give your preschooler an advantage when they begin learning how to read. 3. Pick a word of the week to build vocabulary. There is a reason why Sesame Street still picks a “word on the street” and uses it throughout their show. Repetition works, especially when you focus on one particular word and use it in different contexts. So, let’s say we choose the word “colorful.” Use this word throughout the week to describe their colorful shirt, a colorful toy, a colorful salad, and it won’t be long until you hear your preschooler doing the same! Their vocabulary will be the most colorful in the class and it will later positively impact their writing. 4. Play an alphabet game. Our favorite go-to game on the road or late in the evening when we’re winding down is to play an alphabet game. Pick a category and try to name one thing in that category that starts with each letter of the alphabet. Foods is one we usually play, starting with “A is for apple” and having to get a little creative- or do a quick Google search- when it comes to Q and X. Word association games are simple ways to get those little minds thinking, making connections and figuring out how words work. Most of all, have fun with your preschooler as they explore and learn. It’s a win-win to get to be silly and boost their learning in those sweet preschool years! What are some simple and fun learning games you play with your preschooler? Let me just say THANK YOU for posting this! Recently I have been struggling with my four-year-old’s willingness to learn and it’s so frustrating. She’s slowly becoming a ‘TV kid’ so I downloaded ABC Mouse this week in hopes of engaging her in something more beneficial, but she appears to already be bored with the app. I am going to come up with another plan and incorporate these tips! I love this post! My daughter turns 4 at the end of January and you can really feel how much they love learning new things at that age. I have not heard these five tips before, but will definitely try them. So glad these were helpful. Four year olds are lots of fun (most of the time ha, ha!). Thanks Ben!